An Extended Validation (EV) SSL Certificate is the ultimate confirmation in the mind of online customers that a website is secure and safe to use. It ensures the highest level of trust by offering exclusive, premium features available only to officially registered companies. An authentic and professional company operates the website. The website in question employs advanced encryption to protect sensitive data. Such transparency and web security measures improve conversions and keep your customers happy. Besides offering high-end encryption, EV SSL Certificates also protect your business from damaging phishing attacks. A cyber-threat like this, may destroy your hard-earned reputation and bring trouble. In a typical phishing attack, a hacker uses your business credentials to spread malware via email. With an EV certificate, this trick is likely to fail, as customers will recognize the genuine website from the fake one. Any official business with a website can get an EV SSL Certificate. To pass the extended validation, you must provide to the Certificate Authority relevant and up to date documentation confirming your official business status. The CA will perform an extensive check of all your paperwork, and issue the extended validation certificate in 1 to 7 business days. Depending on your encryption needs, an EV SSL Certificate can secure one domain (Single Domain EV SSL), multiple domains (Multi-Domain EV SSL), and even software and applications (Code Signing EV SSL). Extended Validation certificates can protect both the bare version of your website (e.g., yoursite.com) and the “www” version of your main domain (e.g., www.yoursite.com). You will find this feature in most of the EV products, but certain EV certs will secure only the exact name you put in your CSR (Certificate Signing Request). If you include www.yoursite.com, the yoursite.com version will remain unprotected. You’ll need to redirect all the traffic to the HTTPS domain. Make sure you check your certificate’s specs, before submitting the CSR to the CA. A regular, Single Domain Extended Validation certificate will enable the green address bar across all your pages such as yoursite.com/blog, yoursite.com/store, yoursite.com/checkout, etc. If you want to add the green address bar to several websites, then opt for a versatile Multi-Domain EV SSL certificate. When applying for a Multi-Domain EV SSL certificate, you need to specify your first domain name (e.g., yoursite.com). Under the CSR text area, in the additional domains’ fields (SANs) include the rest of domains or subdomains you want to encrypt. After the Certificate Authority verifies and approves your request, it will send the certificate files to your email. Your next step is to install and configure the EV cert on your server. As online users become more aware of cyber-threats, the EV green address bar is a powerful security indicator that almost everyone knows and trusts. With an EV SSL certificate by your side, no one will ever question your security standards. Moreover, your visitors will browse and shop with confidence. No matter your niche and financial resources, at SSL Dragon you’ll find top-class EV Certificates suitable for any budget and website. Whether you need a cheap EV SSL product to secure one website, or a more expensive Multi-Domain EV certificate to encrypt an entire network of sites, you’re spoiled with choice. Cheap EV SSL Certificates are not a myth. The likes of Comodo (now Sectigo) pride themselves in offering affordable Extended Validation products for companies of all sizes. Comodo EV SSL Certificates will bring your website the same advanced encryption and extra features at a friendly price. Unless you want to secure a huge system or a financial institution, a Comodo EV cert is a perfect addition to your site. All EV SSL Certificates follow the latest levels of encryption and security protocols irrespective of type, brand and price. The 256-bit certificate encryption and the 2048 key encryption are more than enough to keep even the brightest hackers away from your site. Breaking the SSL encryption is beyond human capabilities. Extended Validation SSL Certificates work on 99.3% of web browsers. Even if your visitors use older browsers versions, the EV SSL cert will display the green bar, and secure sensitive information. You can configure them on all the popular server platforms and email clients. EV certificates also run smoothly on Android, Windows and OS apps and browsers. All EV SSL certificates include static or dynamic site seals to further improve customer trust. You can place the seal anywhere on your website and watch as traffic and conversions grow. For your peace of mind, the EV certificates also contain a generous SSL warranty against fraudulent issuance and data breach. Multi-Domain EV SSL Certificates secure multiple domains under a single SSL installation. If your company owns a network of sites, one Multi-Domain EV certificate will enable the prominent green address bar on all your websites. A sole multi-domain cert can handle up to 250 websites. You need to install and renew it just once. Imagine how much time and money you can save. Instead of buying separate certificates for each site and spending hours on configuration, you can get a multi-domain EV SSL cert and keep your security workload to a minimum. Depending on what multi-domain cert you choose, you can secure up to 4 domains by default. If you need more websites, you can include additional SANs at the checkout page for an extra charge. To apply for your EV Multi-Domain cert, you must specify your first domain in the common name (your primary domain) field of your CSR. For instance, yoursite.com. Right under the CSR text area, in the following domains’ fields (SANs), you need to add the rest of the domains you want to protect. For example, yoursecondsite.com, yourthirdsite.com, etc. Extended Validation Code Signing certificates provide the utmost security to your customers and protect the authenticity and reputation of your digital products. They digitally sign downloadable goods such as scripts, codes, and software, and also stop malicious attackers from altering them. Just like the regular SSL certificates protect the sensitive data traveling between browsers and websites, Code Signing EV SSL Certificates ensure that your digital content is genuine and safe to use. If you don’t include a Code Signing cert into your software, it will show as “Unknown Publisher” to the user. With such uncertainty, no one will want to use the program. When you download and install software, a dialog box usually pops up and informs you whether the software is signed by the company A or B, or isn’t signed by anyone. If it’s signed, it means a Code Signing SSL Certificate secures the code and displays the official name of the code publisher. Code Signing certs guarantee that your code will always remain clean and authentic. If someone changes it, the digital signature protecting the code will break immediately, and the user will receive a warning message. EV Code Signing certs are compatible with 32-bit and 64-bit modes, as well numerous file extensions including as .exe, .cab, .dll, .ocx, .msi, .xpi, and .xap files, and kernel mode software. Code Signing EV certs also offer hardware token and PIN while signing the code. Why no Wildcard EV SSL? If you’re wondering why can’t find an Extended Validation Wildcard SSL certificate in our wide range of EV SSL products, we have the answer. Since Wildcard certs can secure unlimited subdomains, Wildcard EV SSL would require a long and expensive verification process, which the leading CAs can’t afford. But it’s not only about time and money; security wise, EV Wildcard certificates would be vulnerable to man-in-the-middle attacks, especially if one Wildcard certificate were assigned to hundreds of subdomains. Since EV Certificates offer the highest level of trust and perform extensive checks of each web address to which they are assigned, verifying the identity and integrity of each subdomain would take weeks not days. The EV SSL Certificates excel in their current state. 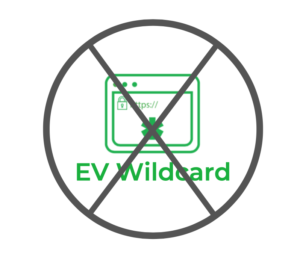 Adding the EV option to Wildcard certificates will devalue EV products, and make the whole SSL industry less secure.